"Before we installed tFLOW, we hadn’t realized the potential of our RIP software and cutting platform and how they could all work together. Looking back now, I don’t know how we got anything through the shop without it!" 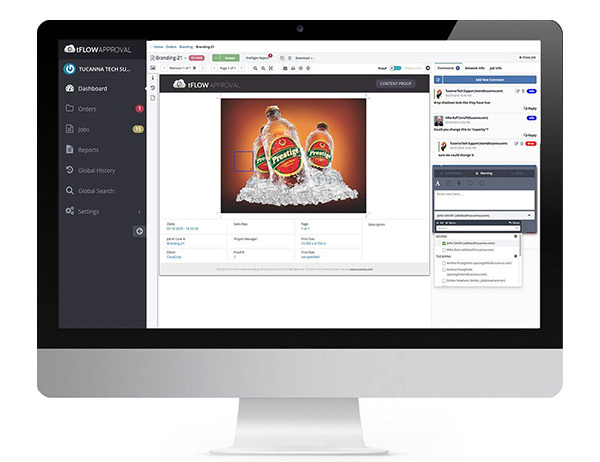 tFLOW connects with Aleyant Pressero and PrintJobManager. In addition, it integrates with any MIS/ERP, Web-to-Print, and Output System. tFLOW automation not only lowers costs and reduces cycle times, but it increases throughput, allowing you to run more and larger jobs through your shop without an increase in staff. Let tFLOW handle the mundane work of proofing and fixing files so you can get jobs out the door more quickly. Your customers will love how tFLOW keeps all job related files in centralized location for easy approvals and status checks in a 24/7 cloud-based environment. Files print accurately the first time. tFLOW automatically proofs files up front for common errors to ensure they are truly production-ready. With tFLOW, prepress resources can now be redeployed to work that is BILLABLE instead of being buried in routine work. tFLOW’s centralized communication portal organizes all your job status and file information for fast, easy access. tFLOW automatically creates proofs based on your templates. Create your own layout with the information you would like to appear on the proof, and tFLOW will autofill the fields as well as automatically place artwork on landscape and portrait layouts. You can also add elements such as marks, trim, live area indicators, and finishing parameters Proofs are automatically sent out for approval, and can also be downloaded as PDF’s. tFLOW puts the “pre” back into preflight Speed up your turnaround times as files are automatically checked when they come into your shop, not after they have been sitting in folders for a day. You, your customer, and sales team will know if files are printable within a couple of minutes of receiving them. Files are not just checked, but also fixed, with options such as adding bleed, marks, flattening transparencies, converting fonts to outlines, and checking spot color integrity, to name a few. Realtime information and updates. Stop running around and bombarding everyone with emails. 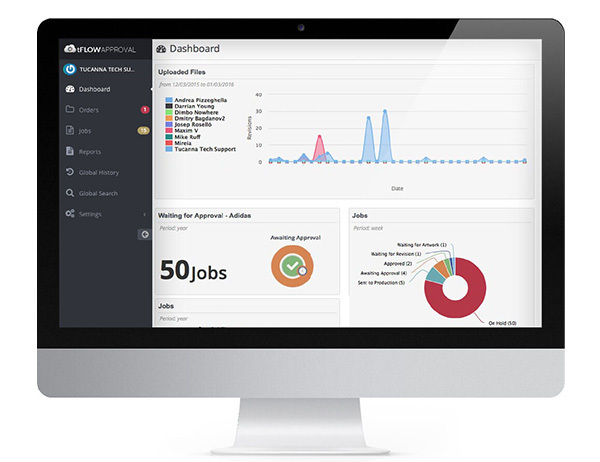 tFLOW will give you status updates on all of your jobs every 15 seconds. Keep track of jobs which are still waiting for approvals, missing artwork, on hold due to preflight errors, and ready to be sent to production. All without a single phone call or email. Automate repetitive prepress tasks. Let designers be designers – spend time on custom projects by automating the boring stuff. Life’s too short to spend the day adding grommet marks, cut paths, bleeds, fold lines, etc. tFLOW doesn’t mind, and is way faster than anyone we have ever met! Stop the email madness! Tired of receiving emails, and being CC’d on countless others? 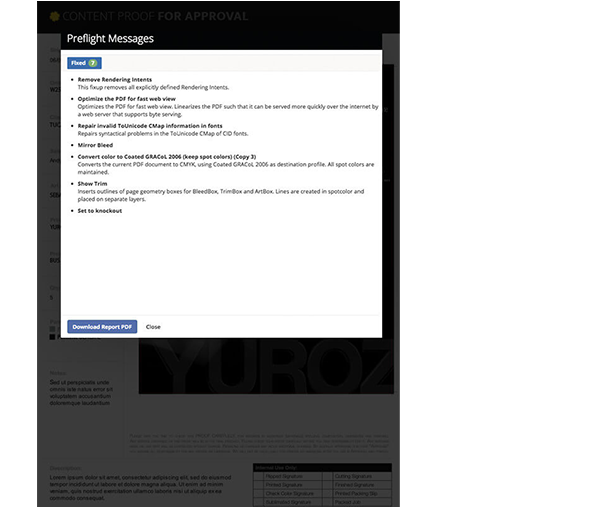 tFLOW allows you to collaborate real-time, making comments and annotations on the proof quick and simple. Everything about the job is visible to everyone on the team – not lost somewhere in your inbox.